I just chanced upon this inspiring Mashable story of Mohamed Nasheed, recently ousted President of the Island nation, Maldives, a group of 2000 small islands in the Indian Ocean. Charismatic and articulate, this crusader’s long fight against climate change, and restoration of human rights and democracy is indeed moving. 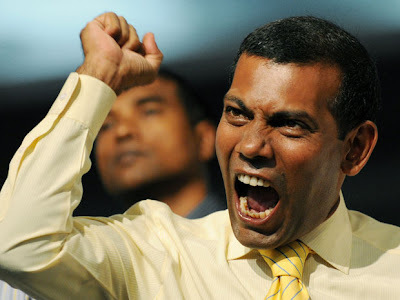 As early as 2004, Mohamed Nasheed organized first public protest against the three-decade-old dictatorship using sms texts and was brutally put down with hundreds arrested. He rode to power during the first multiparty elections in 2008, but in Feb 2012 dictators ousted him and he has now been exiled. But he’s not a man to give up his mission to save the Maldives and its people. He his war against climatic change in international forums and has led to a movie, The Island President, which was launched today in New York. Here are two facts that might stir you to see his movie - Maldives is just about two metres above sea level. And coastal erosion has already led to relocation of people from 16 islands. Just hit the The Island President trailer below and you’ll be inspired by this man’s story. THE ISLAND PRESIDENT—A Documentary By Jon Shenk | Official Trailer from Sawyer Studios on Vimeo. With 60% of the country’s population below 30, Mohamed Nasheed feels that it’s time the youth became aware of a submerging nation. And he’s using the cost-effective social media to amplify his message not just to youth in Maldives but leaders across the globe to help save the Island. He needs your help, share his story and earn some karma. Do you know another inspirational story, share it with us.